Mathiisen is a town in central Auridon, just over the western cliffs of southern Calambar. It is located southwest of Skywatch and north of Phaer. Buraniim Isle is just off the coast. Natural beauty of the cliffs and isles around Mathiisen is extreme. The area around the settlement is dotted by magnificent Aldmeri ruins of both fortresses and ancient seaports, and vast deciduous forests of laurel, maple, and larch trees lies to the west of the town. The unwalled port is carved on the western cliffs of Auridon, open to a bay, protected from the sea, between Buraniim Isle and Skywatch. The underground beneath Mathiisen is full of tunnels which lead to the sea. Elegant walled estates dot the outskirts of the town and by the sea. They were thought to be the apogee of Aldmeri architecture. The coastal settlement was founded, at least, during the First Era as a steel-forging town. During the First Aldmeri Dominion, there was an important population of Bosmer and Khajiit living in Mathiisen. They were labor immigrants from the mainland who work on the steel forges and their wages were lower than those of the native Altmer. Mass-scaled immigration to Auridon started since the very foundation of the Dominion. 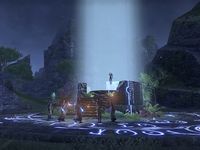 After the Soulburst of 2E 578 (or 2E 579), which sundered the veil between Nirn and Oblivion, and disrupted the connection between the souls of the denizens of Nirn and their mortal hosts, come the Planemeld, a massive Daedric invasion of Tamriel by the Daedric Prince Molag Bal in the year 2E 582. Just outside the town of Mathiisen he used one of his Dark Anchors, huge Daedric interplanar machines, in an attempt to drag Nirn out of Mundus and into his own realm of Coldharbour. The so-called Calambar Dolmen was destroyed multiple times by the Auridon Chapter of the Fighters Guild, not without local complains about outlander interference in Summerset affairs. The Planemeld was ultimately prevented by the forces of Meridia, the Soulless One and the Eight Divines. In 2E 582, the then current Forgemaster and Canonreeve were supporters of the Veiled Heritance, while they were supervised by Sergeant-at-Arms Ondenil, a high-ranking member of the organization. They used the ancient tunnels beneath Mathiisen to smuggle weapons crafted in the town's forges to the soldiers of the supremacist movement lead by High Kinlady Estre, the Veiled Queen. Reports of spies linked to the intelligence of Queen Ayrenn led the Eye of the Queen to the town, where they discover the entire plot. When confronted and without escape, Canonreeve Malanie and Forgemaster Condalin did not surrender to the Crown and they were killed by the Eyes of the Queen. Even after the Veiled Heritance conspiration in the town was suppressed by Eye of Queen agents and both the former Canonreeve and Forgemaster were replaced after their execution, the steel industry's productivity was not affected. However, High Kinlord Rilis XIII was not happy about the town's implication in the conspiration against the crown and decided to try to supply their First Auridon Marines with some product from Greenwater Cove, unsuccessfully, as the town was razed by the Sea Viper of the Maormer that same year. Mathiisen has always been an integral part of the realm of the Summerset Isles since its foundation by the Alinor Monarchs. A canonreeve is tasked to rule the settlement. Furthermore, a Forgemaster is intended with keeping the town's steel industry running. In Mathiisen, it is a position almost as powerful and respected by the townsfolk as that of the Canonreeve. The underground tunnels beneath Mathiisen have been used by both smugglers, criminal organizations, and insurgence movements for a variety of purposes. Mathiisen was a popular hideout for the nobles and wealthy of Auridon during the Second Era, who built elegant estates just outside of the town. The settlement has been always known as the origin of the best steel of all of the Summerset Isles. Weapons, tools and jewelry were crafted in the forges of Mathiisen. 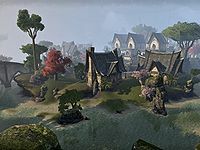 By the time of the First Aldmeri Dominion, the town was the supplier of weapons to both the royal armies of Summerset and Valenwood.